The older man surveys our table laden with food and shakes his head. "Too much!" he says smiling and shaking his head. It wouldn't be the first time that we had the size of our order questioned but it was the first time we had been told off for it! 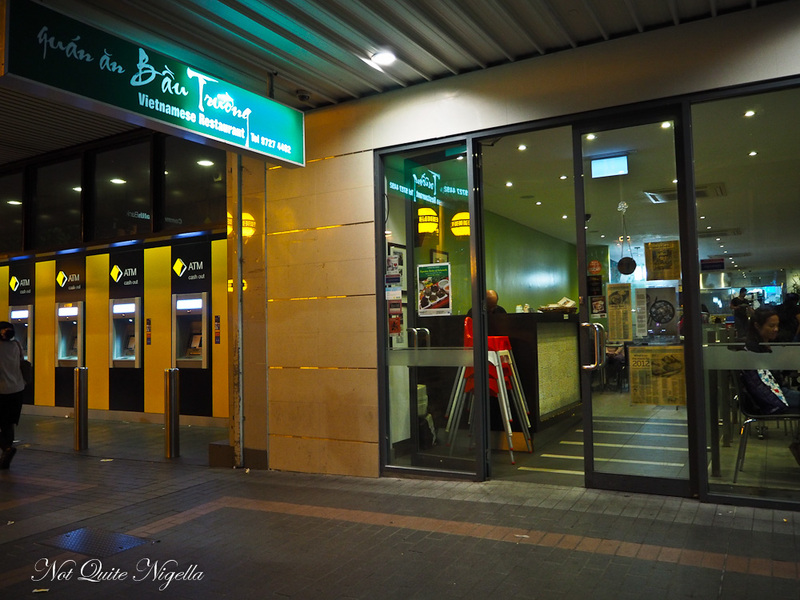 It was an impromptu stop on the way back from a day trip with Belinda and the girls and earlier that evening we had walked into another restaurant that didn't have Mia and Ruby's favourite Vietnamese items. To avoid any tantrums erupting we apologised and explained why we had to leave-truthfully I was glad because it had an odd smell there. When we walk past Bau Truong the familiar writing on the outside reminds me of how I had meant to visit the Marrickville branch for a while. The smells here are more inviting so we take a seat. There are a mix of clientele. A table of four comes in wearing fur coats and high heels. 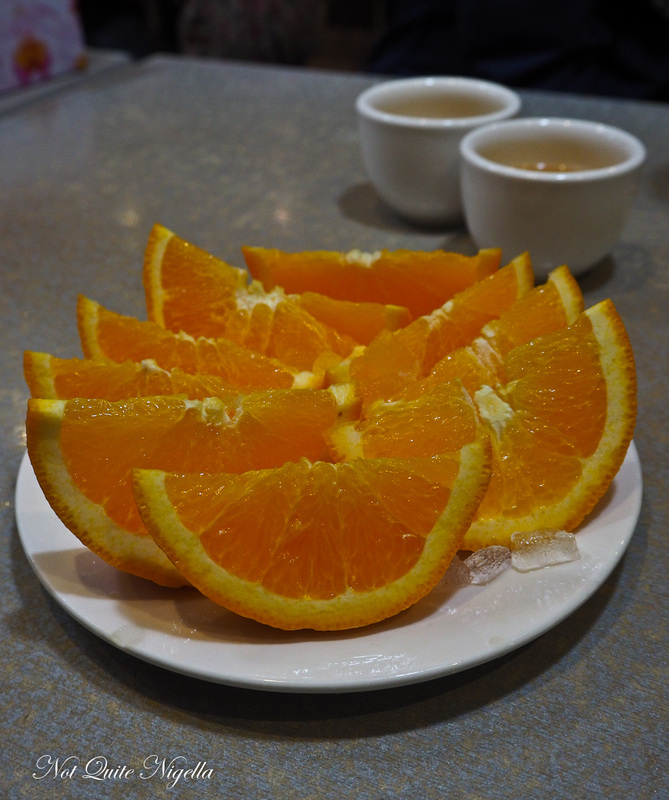 They order plenty of expensive goodies and enough to necessitate an extra table being attached to theirs (likewise for us) while other couples share one bowl of pho or noodles. 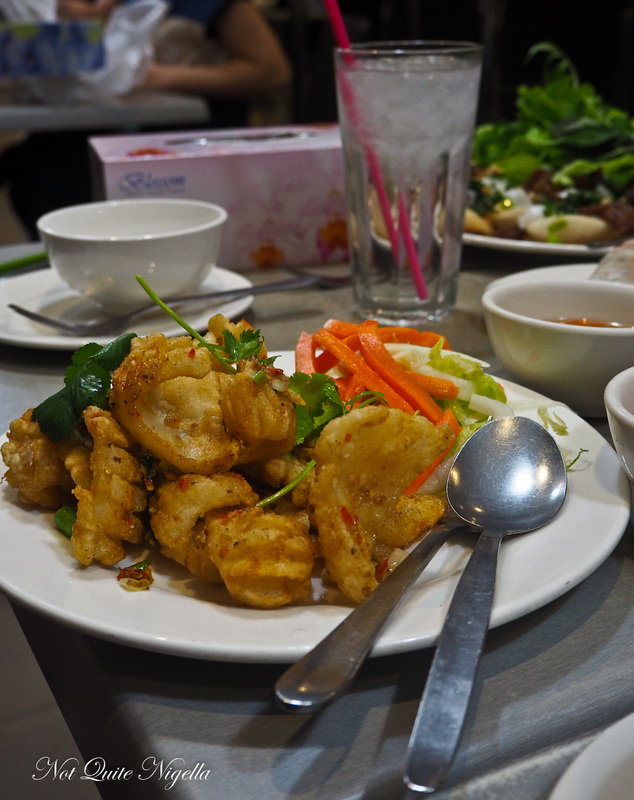 The menu is long and spans many pages and includes interesting items like crocodile, kangaroo and chicken feet salad along with classic Vietnamese offerings. When I come back from using the facilities I see that they've added another table to our two and there are individual bowls of nuoc cham on the table. 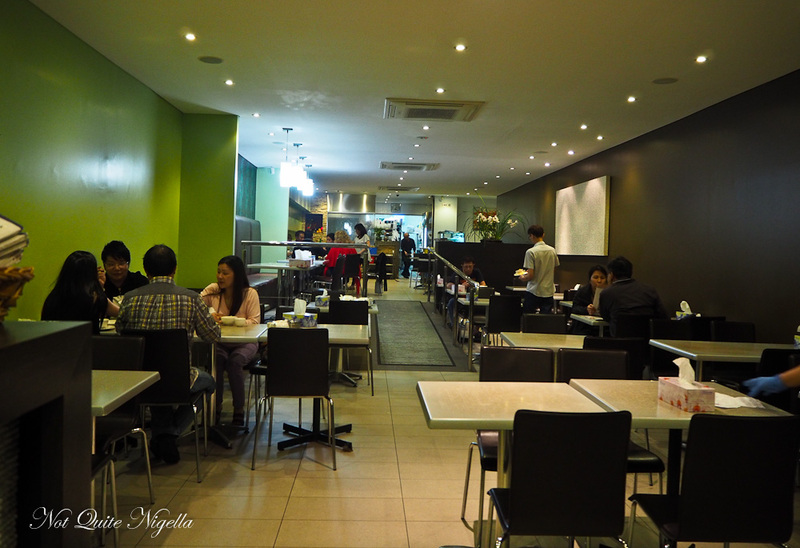 The food comes out very quickly and the first thing to arrive is the crispy chicken with tomato rice. 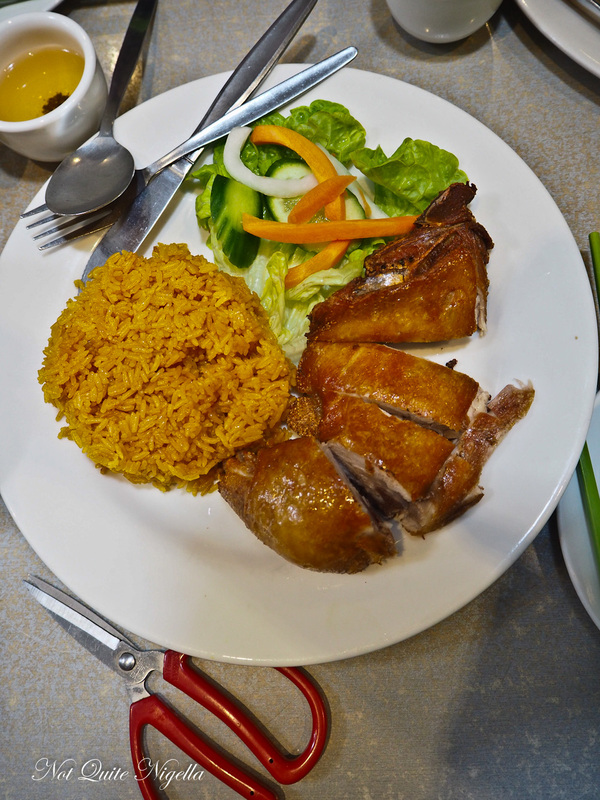 This is Mia's order of chicken which I try a morsel of - it is suitably crispy and the tomato rice is fine but not my favourite tomato rice and I'm constantly in awe of how different tomato rice can taste at every Vietnamese restaurant. 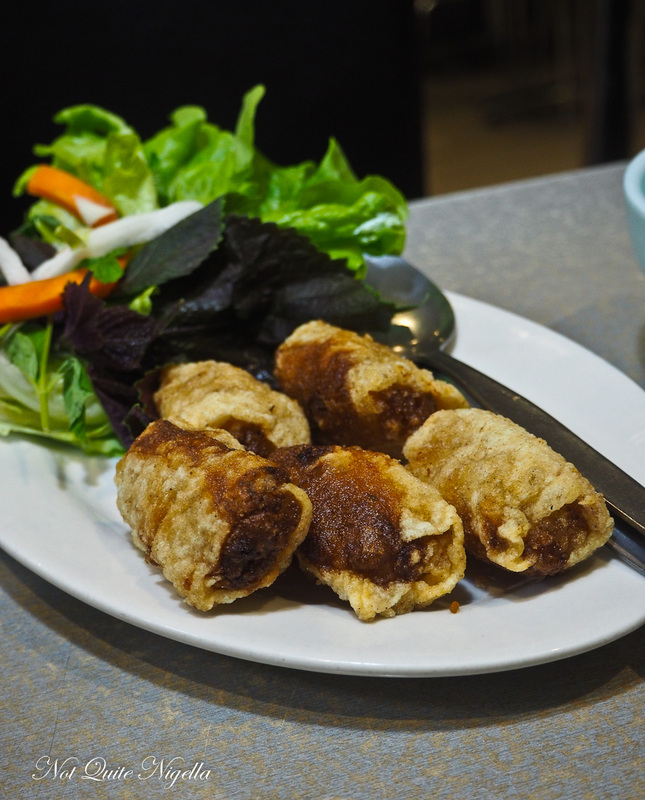 There are three types of spring rolls: pork and taro (the regular spring rolls),fish spring rolls and seafood spring rolls. We opt for the latter and they are fantastic-it's hard to stop at one. Alas the Vietnamese mung bean pancake is a tad on the oily side. 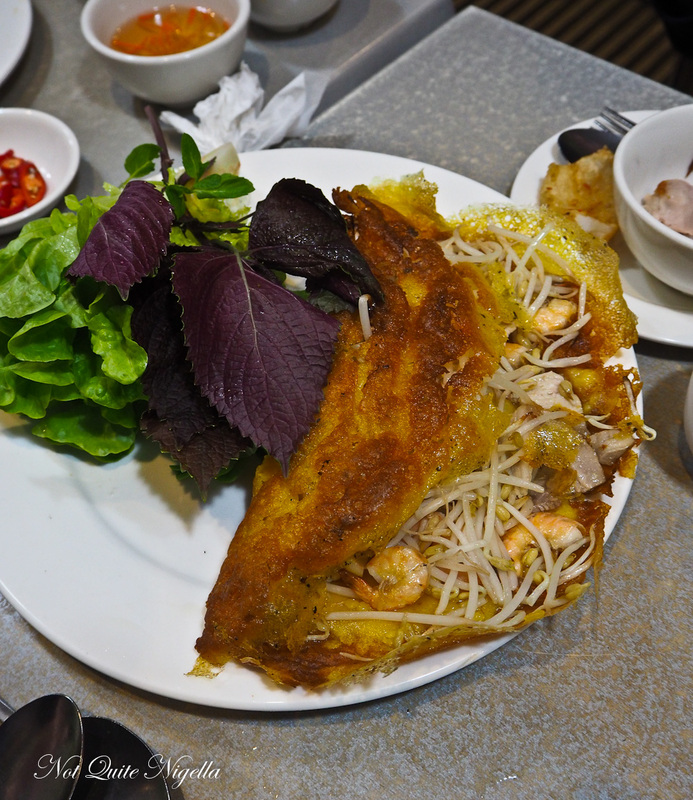 It is filled with bean sprouts, pork and prawns but needs a real kick from sauces. This is a really rich dish that doesn't really look like the photo on the menu. 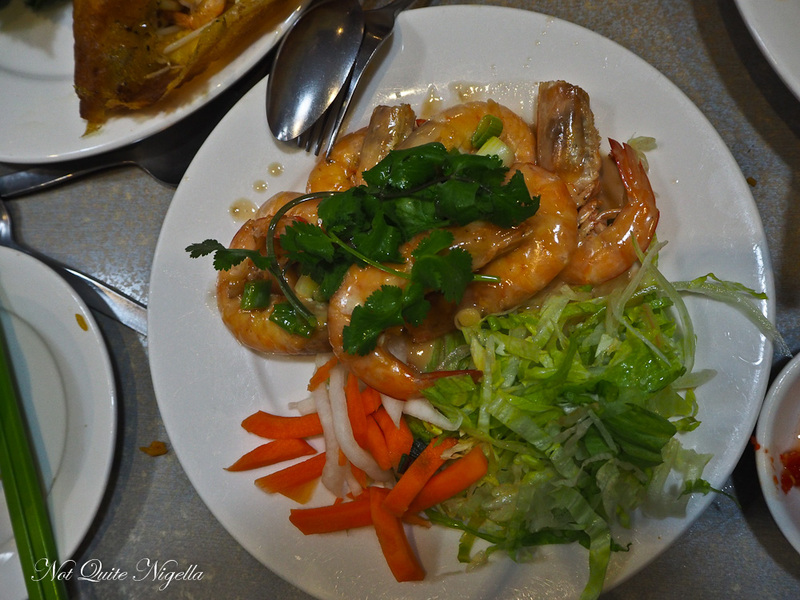 It smells delicious but we can only manage a prawn or two each, partly because it is really rich but also it would have been really good if the prawn were served out of the shell so that you can taste the sauce and the prawn without having to peel it. I'm afraid that I can't work out the price of these as I thought that I had written it down but clearly I hadn't. They are a recommendation from the waiter and I'm so glad that we ordered them because they are my and Belinda's favourite dish of the night. 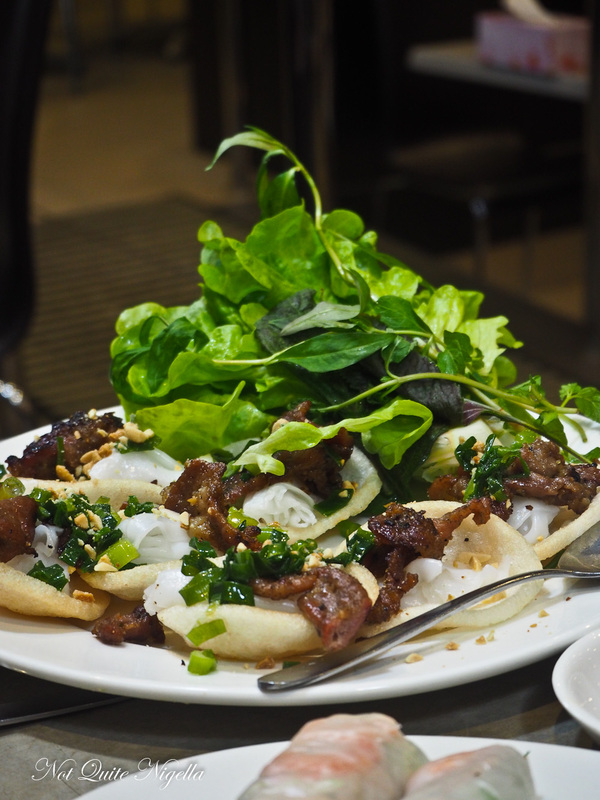 The prawn crackers are filled with cushioney soft wide rice noodles and topped with char smoked sweet pork and spring onions. I fold up some herbs and soft lettuce on top and it's just a bite from heaven every time. And I ate four of these. Yes I'm sure if that waiter guy had passed us while I was eating them he would shake his head and say "Too much!". 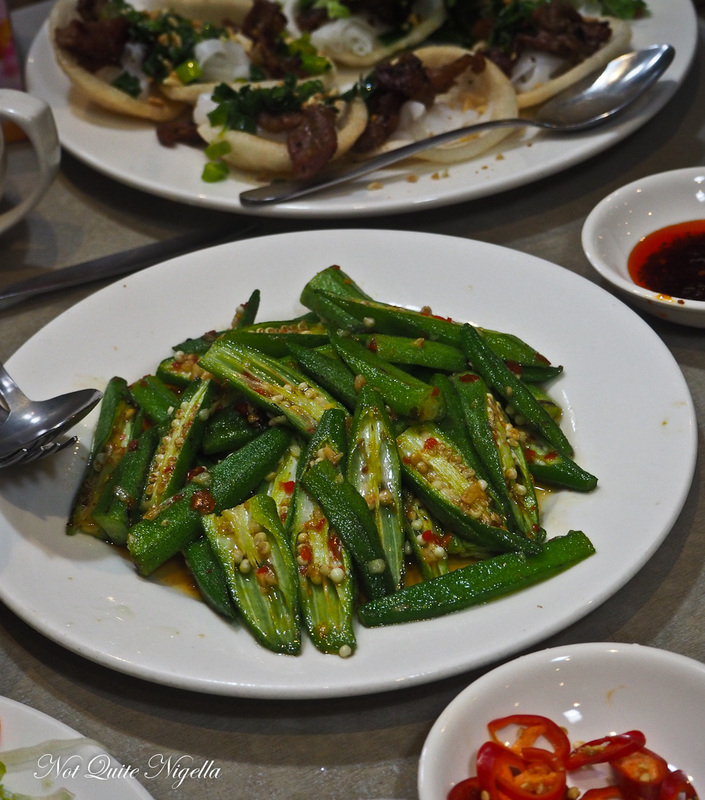 My other favourite dish of the night is the simply cooked okra that has none of the sliminess usually associated with okra. Split down the centre horizontally it's flash fried with plenty of chilli and garlic in a sweet sauce. In fact drizzling some of the sauce over the tomato rice brings it to life. With plates still laden with food and one hungry husband coming home late from work we signal the waiter with the Vanilla Ice haircut and he brings over the plastic containers. "I had them ready for you, I knew you'd need them," he says. So tell me Dear Reader, have you ever been told off for ordering too much?